A determined six-year-old has walked four miles to raise cash for the Margate RNLI despite suffering with joint hypermobility syndrome. Maizie Barnes walked from their Sweyn Road home in Cliftonville with her parents Ria and Simon to her grandparent’s home in Queen Bertha Avenue, Birchington. The walk raised £200 for the RNLI and a cheque for the amount has been presented to crew at Margate. 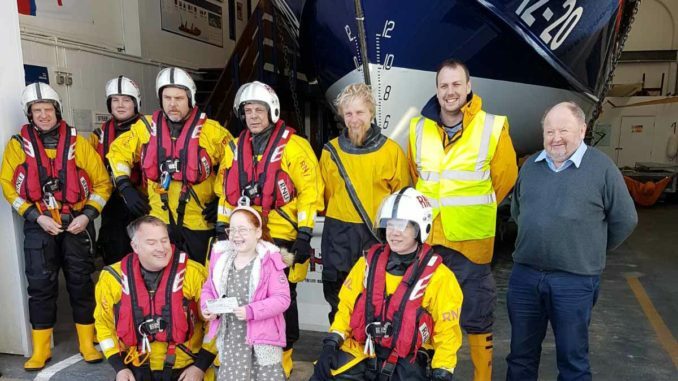 A spokesman for Margate RNLI said: “It was a pleasure to meet six year old Maizie Barnes and her family at the lifeboat station. Duo exhibit art at Pie Factory Margate made by posting it to each other!